This area contains the overview of your current, future, and past events. From here you can create and edit events as well as fine tune site-wide event settings. Add New Event button – Found at the top of the page, this button will take you to the new event page. Filters – Here you can select to view All Events, Events occurring today, or Events occurring this month. You can also filter events by month/year and by the event status. Delete – delete the event. Note that events are not truly deleted and remain in your database and are accessible via the Deleted filter. You can create and manage Event Categories here. 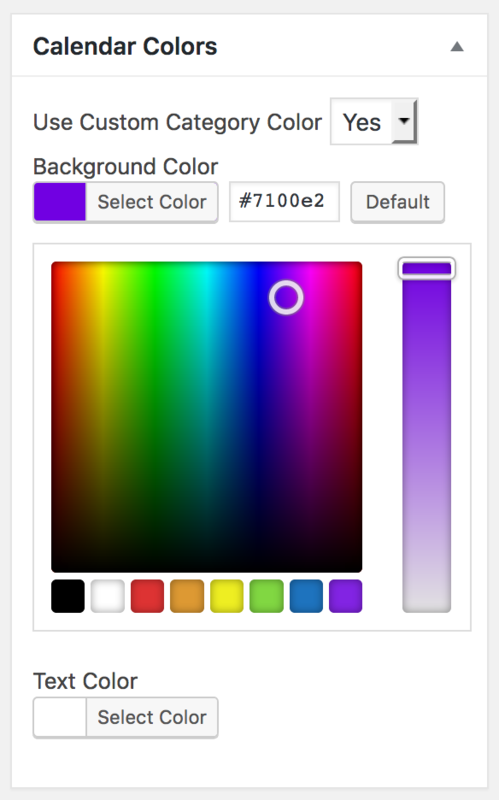 Each category has a set of “Calendar Colors” options where you can set a background color and text color. These color settings can be used by the Calendar when displaying events. First, create your categories, set their colors, then assign one category to each event. The events assigned to a category will be displayed in the calendar using their selected category colors. Event Categories are a custom WordPress taxonomy that automatically get displayed in a taxonomy archive. Event Category archives can be found at the following URL yoursite.com/event-category/your-category-slug. You can change how the single event pages, the event lists, and the ticket selectors are displayed with the settings here. 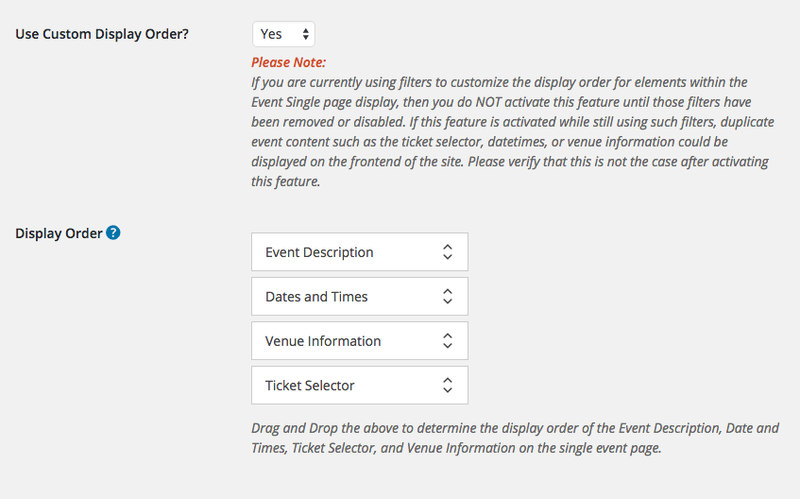 For example, if you want to move the Ticket Selector to the bottom of the event page, you set Use Custom Display Order? to Yes and drag and drop the Ticket Selector to the bottom of the Display Order. These options are site wide, so all events are affected, unless otherwise over ruled in an individual event. Default Registration Status – This value will be automatically filled in for each person’s registration status, until payment is made, for each event. You can trash any unneeded default tickets here. Note there must be at least one default ticket. You can change the amount of events that display per page and remove columns by clicking on the Screen Options tab on the upper right corner of the Events admin page. Each column’s visibility is controlled by a checkbox, and the Pagination (number of events per page) is controlled by inputting a number. The Event Overview section allows you to see all of the events that have been created, past and present, along with at a glance details of each event. From here you can select and edit individual events, find and edit all the attendees or attendees specific to an event, export spreadsheets, mass email attendees and more. Add New Event: Adds a new event, see the Add New Event documentation for details of that screen. by category: this is the Event category not the standard WordPress one. Since version 3.1.29 there has been a new system in play that limits the number of Events or Attendees displayed to 50. This can be increased by clicking the dropdown box next to the Retrieve button and selecting a new amount and then clicking the Retrieve button. Show/Hide Columns: Need more or less info on the events, click this. You can show or hide the following columns – Venue, Start Date, Start Time, DoW (Day of Week), Reg (Registration) Begins, Status, Attendees, Actions. Very similar to the post or page lists in WordPress, here you can see all the events you have, alongside the at a glance information. ID: The event ID, often used in coding. Don’t confuse this with the Event Identifier. Venue: If you have a venue attached to the event, its name will display here. Start Date: The start date of the event. Start Time: The start time of the event. DoW: The day of the Week the start date is on. Reg Begins: The full date and time of when registration begins. Status: See the filters above for details. Attendees: Shows the number of attendees registered against the max number of attendees set for the event. Actions: These icons show different actions you can make with the events. See below. View Event: Opens up the event registration page in a new window. Edit Event: Opens the edit event page. Event Attendees: Opens the attendee list for that event. View Report: Opens the attendee list for that page with added informational graphs. Short Code: Shows a pop up with the short url and shortcode for that event. The short url is the link to the event you can give in emails etc. The shortcode can be pasted into any post or page on your site and it will display the event registration details. Excel Export: Exports a XLS file with the event and attendee details. CSV Export: Exports a CSV file with the event and attendee details. Event Newsletter/Email: Allows you to email all the attendees of that event directly from your dashboard. Useful for important event announcements. Delete Events: When you select one or more events using the tick boxes or the check all tick box you can delete those specific events. Use with care! Import Events: Import events via a CSV file. Please check out the sample file that we have provided, in order to make sure the events import correctly. Also not that the file must be a CSV file, not XLS. Export All Attendee Data: Exports the attendee data for all of the events. Export All Event Data: Exports the event data for all of the events. Add New Event: Takes you to the Add New Event page.